This is a beautiful vintage jewellery box with a faux patent leather, mock croc exterior. The box has a lovely lift up lid with a strap handle, and a matching strap fastener. The handle has strong gold metal fitments, and the fastening strap secures with a matching gold metal clasp. This has a spring loaded, push button release. 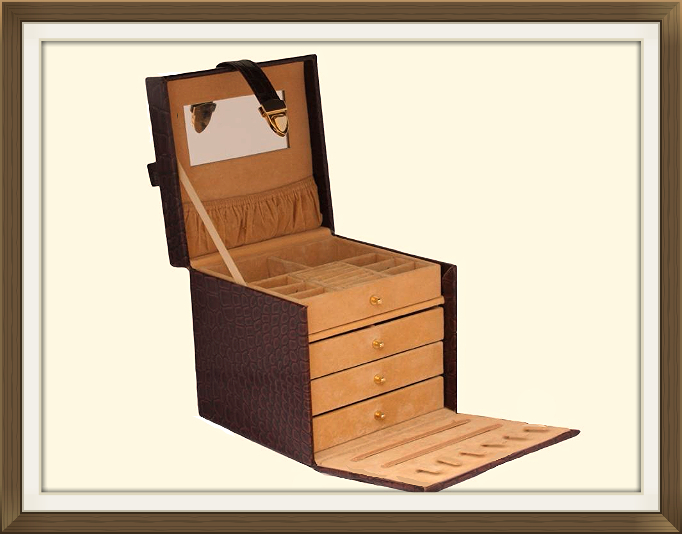 The interior has four storage drawers with decorative gold metal handles. There is a fitted mirror to the inside of the lid with a ruched storage pouch below, and there are further jewellery storage fittings on the drop down flap which conceals the drawers. 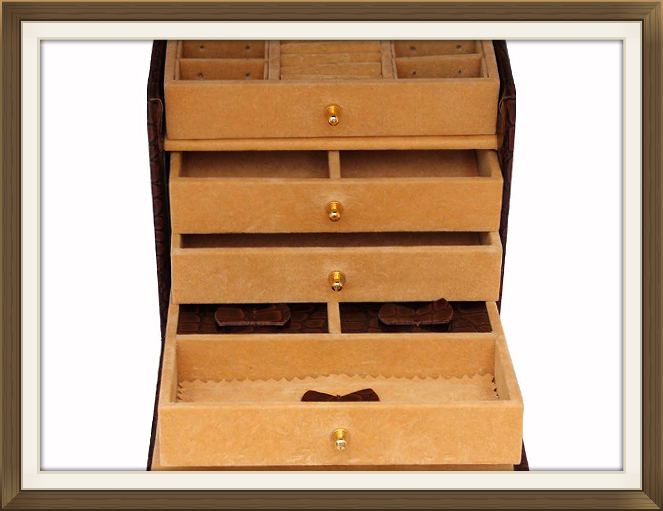 The top drawer has 6 compartments of various sizes. The 2 rear compartments are of equal size, and the 6 smaller compartments to the front, left and right, have pierced holes for stud earrings. 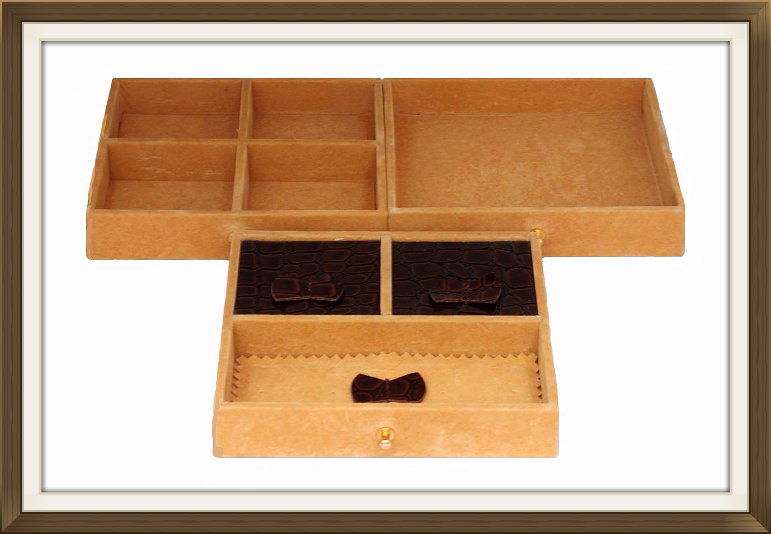 The second drawer has 4 compartments of equal size, and the third has a single larger compartment. The bottom drawer has 2 rear compartments with lift up flap covers, and a larger single compartment to the front. 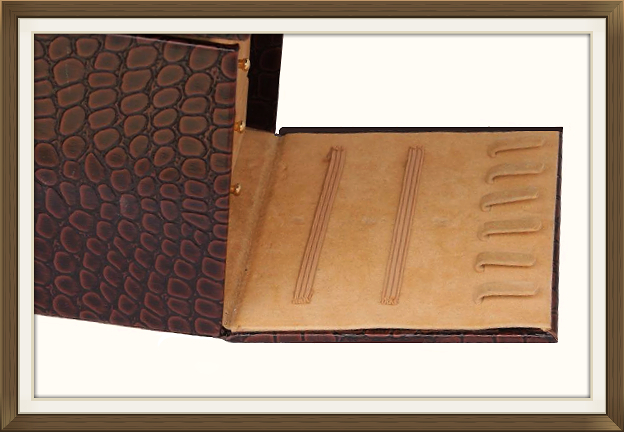 The front compartment has a removable padded insert, for covering and protecting delicate pieces of jewellery. This has pretty zigzag edging. The flap covers to the rear compartments have a mock croc finish to match the exterior. 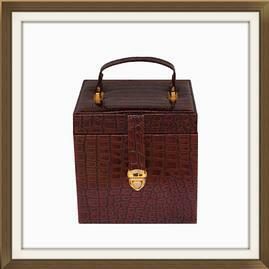 There are beautiful bow shaped mock croc handles to all 3 compartments. The drop down panel which conceals the drawers has 6 hook fitments for holding chains, and 2 elasticated storage bands. The entire interior is lined with soft brushed felt which is beige in colour. 6 by 5cm with a 2cm depth. 3.5 by 2.0cm with a 2cm depth. All 6.0 by 5.5cm with a 2cm depth. 19.8 by 18.7cm with a 2cm depth. 5.5 by 5.3cm with a 1.7cm depth. 12.8 by 5.8cm with a 2cm depth. This lovely box is in very good vintage condition. There is some minor light wear to the faux mock croc leather, just on the left side of the lid. The felt linings to the interior are still very good. Just very minor light wear in a few areas. There is some wear to the edges of the paper linings on the bottom of the drawers. This is expected friction wear from the sliding action. The mirror is perfect with no chips or cracks.